10% Expedia UK discount code for hotels worldwide, for travel until 30 September 2014. The code is valid only for bookings via a mobile device (iPhone or Android). Better than any Radisson discount code, this special rate provides exceptional value especially in big cities, where the regular rates are very high. - for some properties this rate also includes breakfast. This is a discounted rate for family and friends of Carlson employees globally. The Carlson employee name and work location may be required at time of check-in (we used this rate on several occasion and were never asked about it at check-in). Basically, if you know a Carlson employee and the place where he/she works, then you can use this rate (for example, the name of a Radisson hotel manager that you might have befriended during one of your last trips and whose name you can remember by searching on Google or LinkedIn). The link above returns a rate of 80€/$ for Radisson hotels, or 70€/$ at Park Inn or Park Plaza hotels. The rate might not be available at all times and at all properties, but it is definitely worth trying. The only issue is that these rates do not qualify for any loyalty points / promotions. Let us know how it worked for you during the reservation process and during check-in/check-out at the hotel. Radisson promo codes are a rarity these days, so we have come up with this idea on getting the next best thing to a Radisson discount code. Our proposal is to use the Radisson's Best Rates Guarantee, which means that if you book directly through one of Radisson´s website and then, within 24 hours, you find a cheaper rate elsewhere, Radisson will give you the room at 25% discount compared to the cheaper rate. 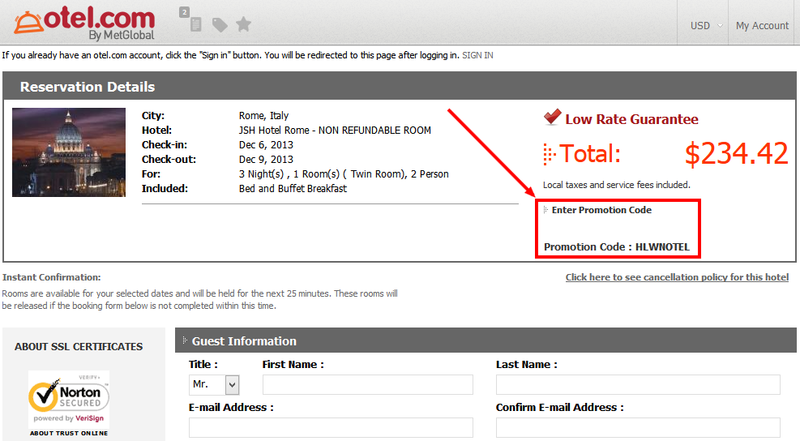 For example: the room costs 100$ on Radisson´s website, you find it at 80$ on another website (e.g. Orbitz), then the final price you will pay to Radisson is 60$ (being a 25% discount from the 80$). The guarantee is valid for Radisson Blu, Radisson Blu Edwardian, Radisson, Park Plaza, Park Inn by Radisson, Country Inns and Suites, as well as art’otel brand hotels. - the competing rate must be available and bookable in the local currency of the hotel. - if you cannot find a cheaper rate elsewhere, write us an e-mail at hotelsrooms@yahoo.com and we will try to help you. 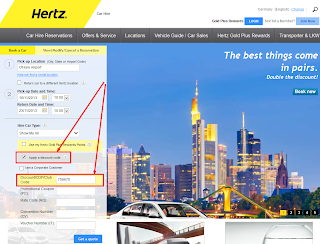 Note the web address of the travel agency and the amount of cheaper rate found - the "Comparison rate" (also make a print-screen showing the cheaper rate). Do NOT make any reservation on that website, as the final purpose is to make a discounted reservation through the Radisson official website. Note down the reservation number, as you will need it to file the claim form (in step 4). The claim must be printed and filled in with all the details and then sent by fax or scanned and then sent by e-mail to BPG@carlsonrezidor.com. 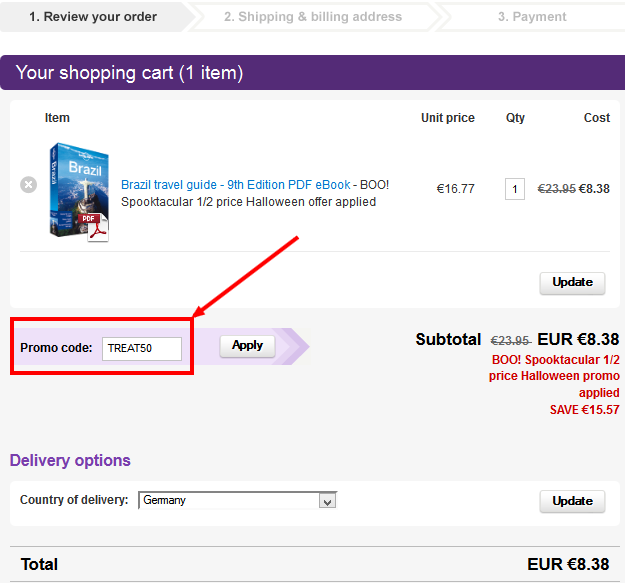 Enclose also print-screens with how you found the cheaper rate. A Radisson representative will contact you within 72 hours. If you have not had a response within this timeframe please e-mail BPG@carlsonrezidor.com. Leave a comment at the end of this article to share your experience in claiming the Radisson Best Rates Guarantee. This Expedia Australia hotel promo code is valid only for mobile device bookings (iPhone, Android or Windows Phone). The offer is valid for bookings with the travel agency Olotels. The deal is valid for double or twin rooms, breakfast included. Even better, the rates are flexible. For example, 1 night over the St. Valentine´s Day has a total price of 83 €, breakfast included, from Olotels. The same room costs 155 € on booking.com. ebookers.com is an online travel agency part of the Orbitz group. The best part of this situation is that all the 5 sites above have the same hotel database at the same prices (only that expressed in different currencies). Thus, buying a room from CheapTickets.com is like a buying a room from ebookers.com. However, the best part is that CheapTickets.com offers a 20% discount code on hotel bookings. 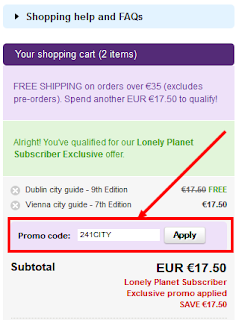 So if you want to get 20% discount compared to ebookers.com, it is advisable to book with CheapTickets.com. Thus, buying a room from CheapTickets.com is like a buying a room from RatesToGo.com. 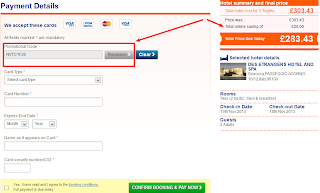 So if you want to get 20% discount compared to RatesToGo.com, it is advisable to book with CheapTickets.com. Continuing our quest for tips and tricks to get Hilton discounts, here is another way to save 50$ from your Hilton booking. The solution is to use the Hilton Best Rates Guarantee, which means that if you book directly through Hilton´s website and then, within 24 hours you find a cheaper rate elsewhere, Hilton will give you a 50$ discount, plus will adjust the room rate to the cheaper rate. 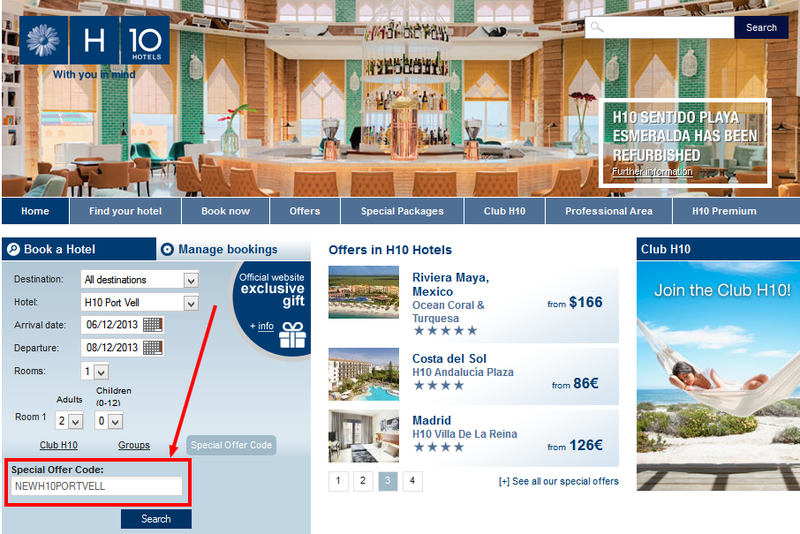 For example: the room costs 100$ on Hilton´s website, you find it at 80$ on another website (e.g. Expedia), then the final cost for your room will be 30$ (being the 80$ for the room minus the 50$ additional discount / rebate). - the cheaper price found elsewhere must be for the same room with the same reservation conditions (the same room type, at the same hotel, with the same dates and length of stay, same number of guests, same designation as either cancellable or non-cancellable, same advance purchase policies, and the same terms and conditions governing the room rate). Note the web address of the travel agency and the amount of cheaper rate found - the "Comparison rate" (also make a print-screen showing the cheaper rate). Do NOT make any reservation on that website, as the final purpose is to make a discounted reservation through the Hilton official website. In the "Comments" section of the claim form, if finding the "Comparison rate" on the other website is not straightforward, provide some details on how you found that rate, so that the Hilton representative can find the same rate. 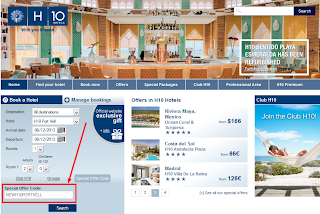 For example, on some websites, not all the rooms and rates are shown, but you need to click on a button "Show all rates". Indicate in the "Comments" section if this was the case. Also, in the "Comments" section indicate whether the "Comparison rate" found elsewhere includes tax, breakfast, etc. A Hilton representative will contact you to inform you about the claim: whether it was approved, or if not, the reasons for dismissal. Here is where the print-screen (see step 2) might come in handy, in case of disagreement with the Hilton representative. Leave a comment at the end of this article to share your experience in claiming the Hilton´s Best Rates Guarantee. Before proceeding with any hotel reservation at hotels from the InterContinental Group (IHG), it is advisable to see if you qualify for their Best Price Guarantee. - the next nights from the same reservation at the lower price found. Of course, this is a unique benefit compared to other chains when the reservation has only 1 night, meaning a free stay at any IHG hotel. It might not always work, as sometimes there are no cheaper rates elsewhere, but it is definitely worth trying (the reward is too big to pass the chance). - the cheaper price found elsewhere must be for the same room with the same reservation conditions (room description and features, cancellation policy, board basis, etc.). Note the web address of the travel agency and the amount of cheaper rate found - the "Comparison rate" (also make a print-screen showing the cheaper rate). Do NOT make any reservation on that website, as the final purpose is to make a discounted reservation through the IHG official website. Pay attention: the comparison website must show the rate in the same currency as on the IHG website (the rate on the comparison website must be available, viewable, quoted, booked, and paid for in the currency of the hotel). If the currency is different, the claim will not qualify for the guarantee. The difference between the IHG rate and the lower rate must be of at least 1$ or 1%, whichever is higher. - TravelRepublic - because it does not provide an automatic confirmation. In order to qualify for the Best Rate Guarantee, you must book a IHG Rewards Club rate. In the "Comments" section of the claim form, if finding the "Comparison rate" on the other website is not straightforward, provide some details on how you found that rate, so that the IHG representative can find the same rate. An IHG representative will contact you to inform you about the claim: whether it was approved, or if not, the reasons for dismissal. 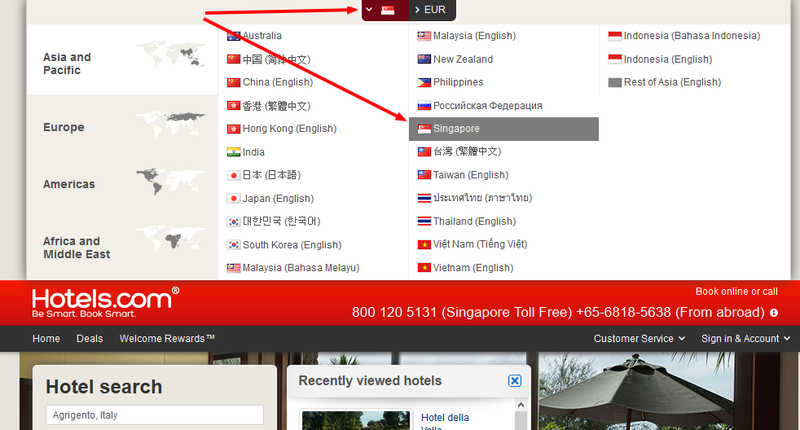 Here is where the print-screen (see step 2) might come in handy, in case of disagreement with the IHG representative. Leave a comment at the end of this article to share your experience in claiming the IHG Best Price Guarantee. The offer is for superior rooms, breakfast included. For example, 2 nights over the week-end 14 - 16 February 2014 have a total price of € 120, whereas the same room is sold at € 187 by booking.com. The offer, including free breakfast, is valid at the Bernina 1865**** hotel in Samedan, 5 minutes from St. Moritz. To get the best discount, book a holiday of minimum 4 nights. For example, 4 nights during the period 1 - 5 February 2014 have a total price of € 532. The same room is sold at a total of € 1 080 by hotels.com. art'otel is a small chain of luxury hotels part of Radisson group. - valid for exactly 3 night stays. 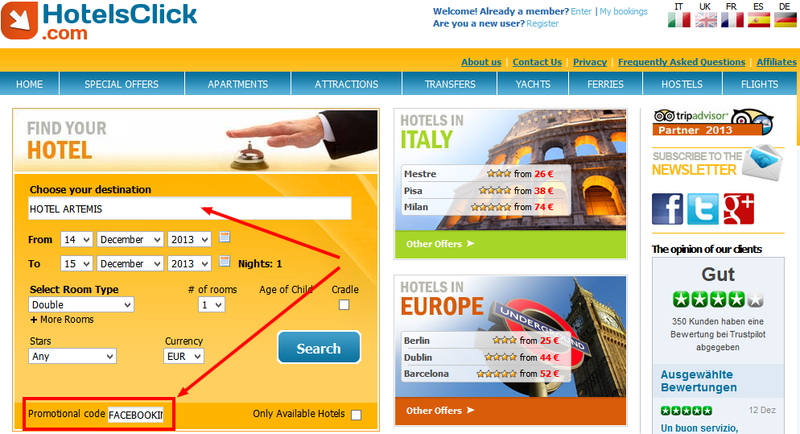 For example, 3 nights starting on 20 Decemeber 2013 have a total price of €479, whereas the same room on booking.com is sold for €723. This 10% Hotels.com coupon code is valid for travel until 31 January 2014. Apart from the temporary discount and offers that may be available at various Moevenpick Hotels, we found a permanent solution to get a 50% discount on room rates. The solution is to use the Movenpick Best Rate Guarantee, which means that if you book directly through Movenpick´s website and then within 24 hours you find a cheaper rate elsewhere, Movenpick will give you the room at 50% discount compared to the cheaper rate, for the first 3 nights of your stay. 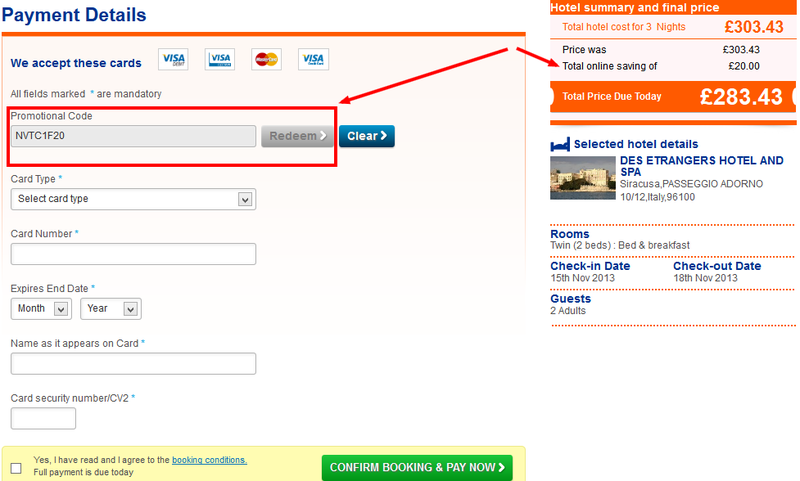 For example: the room costs 100$ on Movenpick´s website, you find it at 80$ on another website (e.g. Expedia), then the final price you will pay to Movenpick is 40$ (being a 50% discount from the 80$). - the cheaper price found elsewhere must be for the same room with the same reservation conditions (cancellation policy, board basis, etc.). 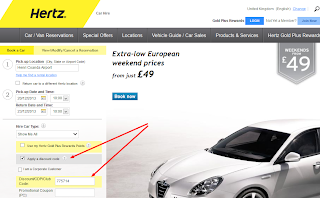 Note the web address of the travel agency and the amount of cheaper rate found - the "Comparison rate" (also make a print-screen showing the cheaper rate). Do NOT make any reservation on that website, as the final purpose is to make a discounted reservation through the Movenpick official website. Note down the reservation number, as you will need it to file the claim (in step 4). A Movenpick representative will contact you during business hours (Monday to Friday) to inform you about the claim: whether it was approved (and you have 50% discount on the lower rate for the first 3 nights of your stay), or if not, the reasons for rejection. Leave a comment at the end of this article to share your experience in claiming the Movenpick´s Best Rate Guarantee. Secret Escapes offers a 50% discount on bed and breakfast rates at the Ramada London Docklands. For example, two nights over the week-end 14 to 16 February 2014 have a total price of £160, breakfast included. The same room costs £328 from booking.com. After having tried various Marriott promo codes, corporate rates and so on, we have finally found the best solution to get significant discounts off of Marriott properties. The solution is to use the Marriott's Look No Further® Best Rate Guarantee, which means that if you book directly through Marriott´s website and then within 24 hours you find a cheaper rate elsewhere, Marriott will give you the room at 25% discount compared to the cheaper rate. For example: the room costs 100$ on Marriott´s website, you find it at 80$ on another website (e.g. Expedia), then the final price you will pay to Marriott is 60$ (being a 25% discount from the 80$). 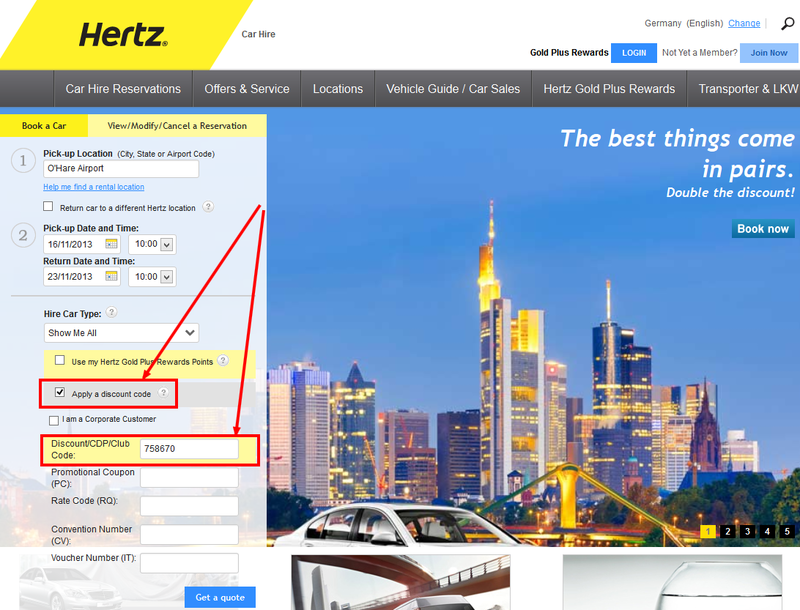 Note the web address of the travel agency and the amount of cheaper rate found - the "Comparison rate" (also make a print-screen showing the cheaper rate). Do NOT make any reservation on that website, as the final purpose is to make a discounted reservation through the Marriott official website. In the "Comments" section of the claim form, if finding the "Comparison rate" on the other website is not straightforward, provide some details on how you found that rate, so that the Marriott representative can find the same rate. A Marriott representative will contact you (usually within 24 hours) to inform you about the claim: whether it was approved, or if not, the reasons for dismissal. Here is where the print-screen (see step 2) might come in handy, in case of disagreement with the Marriott representative. Leave a comment at the end of this article to share your experience in claiming the Marriott´s Best Rate Guarantee. lastminute.com provides some of the best offers among full service online travel agencies. 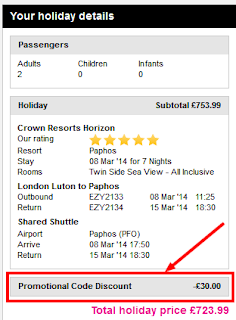 They are currently offering a £30 discount code for holidays, for travel until 31 August 2014 (£600 minimum spend). For stays until 31 January 2014, Park Inn by Radisson offers 30% off their bed and breakfast rate. For example, 2 nights (20 - 22 December 2013) at the Park Inn London Watford*** have a total price of £89. That is a 30% discount from the £127 charged by booking.com. Zuji Singapore offers a 12% discount code for hotels worldwide (travel throughout 2013 and 2014). The discount is valid when paying with a MasterCard, for purchases of minimum 450 Singapore Dollars. The Expedia promo code is valid for stays until 31 March 2014. It can be used for any hotel booking of minimum 100$. The hotels must be booked via a smart-phone or a tablet. More ways to save with Expedia coupons and offers! 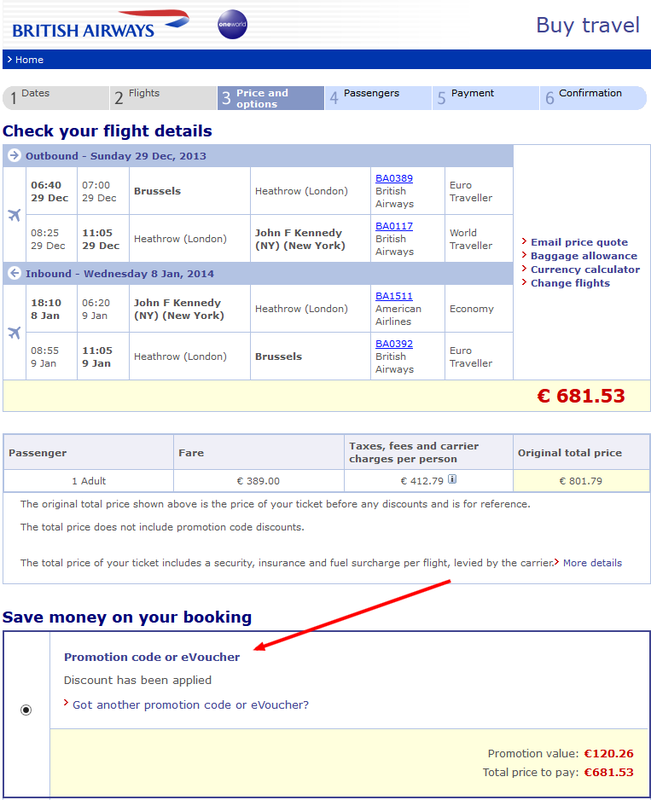 Once the dedicated Expedia page opens, click on the "Terms and conditions" of the coupons to see the details. 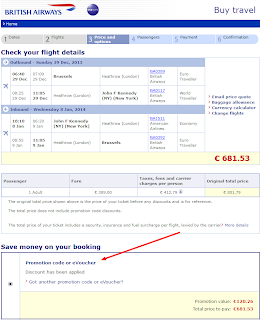 This BA discount code is valid for economy tickets bought until 20 December 2013, for travel until 31 March 2014. The British Airways voucher code is valid only when the currency is EURO (that means for flights departing from the Eurozone). This BA discount code is valid for tickets bought until 31 December 2013, for travel also during 2014. The ticket must be paid with a VISA credit card. The British Airways voucher code is valid only when the currency is USD (that means for flights departing from the USA). Rooms at 70€ / night (breakfast included), for stays until mid-March 2014. A minimum 2 night stay is required. Reservations must be made online via Groupon´s website. This is a great new feature, as there is no voucher to be bought, be a direct booking is to be made, just like with regular travel agencies. For example, two nights over the Christmas period (24 - 26 December 2013) have a total price of 140€ (breakfast included). This is a 45% discount from the 252€ charged by booking.com. £ 79 per room per night (breakfast included) at the 4-star Best Western Plus Seraphine Hammersmith. Offer from HRS, valid for stays for the full months of December 2013 (except the New Year's Eve), January and February 2014. For example, a double room during the night of 21 December 2013 has a price of £ 79 from HRS. The same room costs double (£ 159) on booking.com. Buy 1 get 1 free on absolutely all Lonely Planet products (including travel guides, glossy pictorials, calendars and books for kids). Deal valid only until Sunday, 1 December 2013.
lastminute.com offers the opportunity to attend some of the famous London shows at reduced ticket prices. There are many shows on sale, including, but not limited to: Mamma Mia, Monthy Python's Spamalot, Thriller, Dirty Dancing, Billy Elliot, etc. Auto Europe is one of the best providers of car hire in Europe, both in terms of price, but also in terms of variety of offers. For reservations until 1 December 2013, they are currently providing discounted fares (pick-up of the car may be well into 2014). For example, a compact car (Ford Focus) for 1 week from Rome Ciampino airport (8 - 15 March 2014) is shown by Auto Europe at a total price of 126 €. The lowest price found on Expedia was of 182 € for the same car (that´s 40% more expensive). Hyatt offers a holiday promotion with 20% savings at selected properties. The offers are valid for booking until 24 January 2014, with stays between 7 December 2013 and 31 January 2014. For example, one night (20 December 2013) in Paris at the Hyatt Regency Paris - Charles de Gaulle has a price of 100 €. 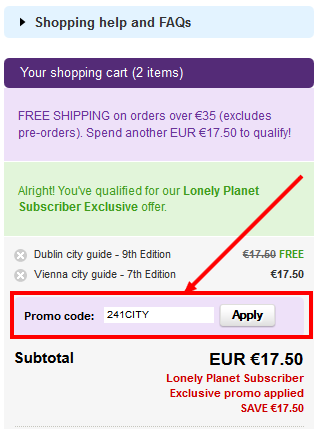 That is a 20% discount from the 125 € charged by booking.com. For bookings until 26 November 2013, Secret Escapes offers superior rooms at the Pentahotel Vienna**** for £61 per night, breakfast included. For example, two nights over the Christmas period 24 to 26 December 2013 have a total price of £122, breakfast included. The same room costs £213 from booking.com. This Orbitz coupon code is valid for stays worldwide until 30 June 2014. The deal is offered by Superbreak.com, a UK based specialist in short breaks and entertainment. The offer is valid for 2 night stays and includes full breakfast daily and dinner on the first night. For example, a queen double room for 2 nights over the week-end 22 - 24 November 2013 has a total price of 218£, including daily breakfast and dinner on the first night. The same room is sold at 340£ by booking.com (but without the free dinner on the first night).